Set on the undulating slopes of the beautiful Bandon Valley, this 18-hole layout enjoys a magnificent sylvan setting. Founded in 1909, Bandon was the first West Cork Club to extend to 18-holes. The clubhouse has recently been refurbished providing excellent new facilities for both members and visitors. The course, which is located two miles west of Bandon boasts a wonderful variety of wild life and recently headed the Golf Ecology Unit as the course with greatest number of bird species in Ireland. 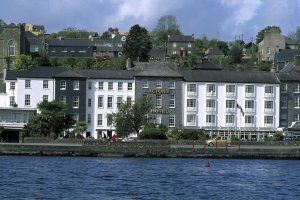 No golfing holiday in West Cork would be complete without a visit to this haven of solitude. Bandon Golf Club won the Munster Final of the Irish Senior Cup when they beat Limerick Golf Club by 3½ matches to 1½ matches at Castletroy on Sunday 15th August 2010, having beaten Doneraile Golf Club by 4 matches to 1 match in the Morning semi-final. The team on the day was Dwayne Twomey, John Carroll, Ger Tobin, Brian O'Donovan, Donal O'Donovan, Dave McCarthy, Barry Nash and Kieran Hurley. They were captained by Denis O’Brien. They made their way to Castlebar Golf Club to compete in the National Final on Friday 17th September, where they were drawn against Connaught Champions Co. Sligo Golf Club in the All-Ireland Semi-Finals. First on the tee was Brian O'Donovan against Barry Anderson who lost out by 5 and 3, he was followed by Ger Tobin who lost his match 5 and 4 against Garry McDermott, next up was Kieran Hurley who won his match by 2 and 1 against Rory McNamara. The penultimate match of Dwayne Twomey against Stephen Brady was down to the wire with Dwayne recording a 1-hole win, the bottom match Donal O'Donovan against Seryth Heavey was a resounding 7 and 6 win and their ticket to the All-Ireland Final the following day against Ulster Champions Lurgan who beat Leinster Champions Kilkenny by 4 matches to 1 match in their semi-final. They were led again by Brian O'Donovan who beat Francis Tallon by 4 and 3, he was followed by Dave McCarthy who halved his match against Dave Sutton, next up was Kieran Hurley who had a convincing 5 and 4 win against Steve Kelly, the penultimate match of Dwayne Twomey was also halved against Gary Clarke, and the bottom match of Donal O'Donovan resulted in a 4 and 2 win over James Horan. Bandon Golf Club won the Munster Final of the Barton Shield when they beat Thurles Golf Club by 6-holes at Castletroy on Saturday 14th August 2010. The team on the day was Dwane Twomey, John Carroll, Ger Tobin, Brian O'Donovan, Donal O'Donovan, Dave McCarthy, Kieran Hurley and they were captained by Denis O'Brien also in the photograph are Liam Horgan Club Captain and Michael Cashman Chairman of the Munster Branch of the GUI. They made their way to Castlebar Golf Club to compete in the National Final on Wednesday 15th September, where they were drawn against Ulster Champions Dunmurry Golf Club in the All-Ireland Semi-Finals. John Carroll and Dwayne Twomey were drawn and drew their match against Darren Crowe and Patrick McGlone in the first match and Donal O'Donovan with Kieran Hurley carried the flag in the second match against Stephen Crowe with Glen McAuley in the bottom match this match was a cliff-hanger and ended with a 1-hole win for the Ulster Champions who went on to win the green pennant when beating Leinster Champions Headfort Golf Club by 5-holes in the All-Ireland Final the following day. The Ladies of Bandon Golf Club won the All-Ireland Final of the Challenge Cup in the ILGU Inter-club Championships at Donabate Golf Club on Sunday 26th September 2010 when they beat East-Leinster Champions Dun Laoghaire Golf Club by 3 Matches to 2 matches. The Ladies of Bandon Golf Club won the Munster Final of the Challenge Cup in the ILGU Inter-club Championships when they beat East Cork Golf Club at Youghal Golf Club by 4 matches to 1 match on Saturday 21st August 2010. First on the tee was Marjorie Banks who won her match against Bridie O'Brien by 5 and 4, she was followed by Ashling Armitage who had a 2 and 1 win over Catriona McGregor, next up was Theresa Burke who recorded a similar win over Joan Lawlor. The bottom two matches of Michelle Anders against Sel O'Leary and Vera Slattery against Barbara McKeown were called-in. They made the long journey to Donabate Golf Club to compete in the National deciders where they met Ulster Champions Kilrea Golf Club in the All-Ireland quarter on Friday 24th September. First on the tee was Georgina Appelbe (30) who won her match by 2-holes against Cathleen Henry (31), she was followed by Eveline Fogarty (30) who had a comfortable 4 and 3 win over Marie Terese Bradley (33), next up was Aileen Burke (30) who clinched the 3rd point for their place in the semi-final with a 3 and 2 win over Kathleen Doherty (34), the penultimate match of Michelle Anders (35) also resulted in a similar winning margin against Rosemary McCamphill (36), the bottom match of Vera Slattery (36) against Teresa Henry (36) was called-in. They met Mid-Leinster Champions Mullingar in the All-Ireland Semi-Final the following day, they were lead again by Georgina Appelbe (30) who beat Alison O'Neill (30) by 5 and 4, she was followed by Eveline Fogarty (30) who had a 3 and 2 win over Bernie Mulroy (34), next up was Aileen Burke (30) who lost her match by 5 and against Carmel Monaghan (34), the penultimate match of Theresa Burke (33) was a 4 and 3 win for Theresa against Julie Magan (36), the bottom match of Michelle Anders (35) was halved against Ann Tyrrell (36). They met East-Leinster Champions Dun Laoghaire in the All-Ireland Final, when they were led again by Georgina Appelbe (30) who lost her match against Emer O'Sullivan (30) by 4 and 2, she was followed by Eveline Fogarty (30) who beat Helen Waters (31) 3 and 1, next up was Aileen Burke (30) who lost her match to Katherine Verso (32) by 6 and 5. The penultimate match of Theresa Burke (33) was a 3 and 2 win over Maureen Duggan (32), so it was all down to the bottom match of Michelle Anders (35) against Bernie Keogh (33), when Michelle had a 3 and 2 win and with it the green pennant. The Ladies of Bandon Golf Club won their Regional Final of the Irish Senior Cup in 2009 and made their way to Mount Wolseley Golf Club in Co. Carlow where they were drawn against Royal Portrush Golf Club in the All-Ireland Quarter Finals on Friday 14th August. They were led by Rhona Brennan against Charlene Reid and lost out by 4 and 3. She was followed by Lillian Burns who had a bad-hair-day when losing out to Naoimh Quigg by 9 and 7. Next up was Mary Scriven who put the first point on the board for the West Cork team when beating Helen Jones by 2 and 1. The penultimate match of Carol Minihane against Lucy Simpson went 5 and 4 to the North Antrim ladies and the bottom match of Paula Reardon against Maura Diamond was halved when called-in. Royal Portrush Golf Club went on to beat Co. Louth in the All-Ireland Semi-Final the following morning by 3½ matches to 1½ matches and went on to lose out to the ladies from Kilkenny Golf Club in a classic All-Ireland Final by 3 matches to 2 matches. Bandon Golf Club won the All-Ireland Mixed Foursomes in 2002, when the team was John Carroll, Kieran Hurley, Donie O'Donovan, J. V. Murphy, M. B. Stafford, Brendan O'Driscoll, Jimmy O'Keeffe, Patrick McCarthy, Kate Davis, Helen Hegarty, Hilda Hegarty, Lia Walsh, Noelle Twomey, Rose Lynch, Carol Minihane, Margaret O'Flynn, Aileen O'Keeffe and Eileen O'Leary, they were managed by Jimmy O'Leary and Ann O'Regan. Bandon Golf Club were Runners-Up to Killarney in the Munster Finals of the Irish Junior Cup in 2002. The team was Dave Long, Adrian O'Donovan, Mike Murphy, Patrick McCarthy, Denis O'Brien, Stuart Sherratt, Trevor O'Donoghue and Billy McGarry. They were, managed by Tony Healy. The Girls' from Bandon Golf Club won the "Girls' Smurfit Inter-Club" National competition at Donaghadee Golf Club on the 20th August 2001. The team was Alison Kingston, Kate Davis and Liz Brennan and Susan O'Leary was the reserve. The team brought back the first green pendant in the history of Mallow Golf Club. 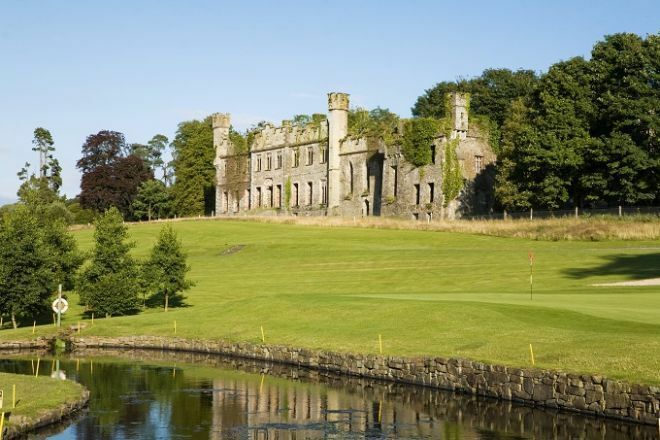 Alison Kingston was selected for the Munster Girls' team for the Smurfit Interprovincial Championship at Enniscrone Golf Club from the 18th to the 20th of April 2001. M. Minihan was elected to the council of the Munster Branch of the GUI for 2001. Bandon Golf Club won the Munster Final of the Barton Shield in 1978, when the team was Finbar Hayes, Donal O'Donovan, Jerry Mehigan and Michael Stafford. They won the Munster Final of the Pierce Purcell Shield in 1988, when the team was Pat Bohane, Sean Caughlan, Joe Hudson, Mick O'Neill, Connie Waugh, Raymond Tobin, Norman Noonan, Tin Ellard, Barry O'Neill, Jim Brennan, Dave Mahon, Tim Noonan, Richard Pratt, Gene Hannagan, Brendan O'Neill and Louis O'Mahony. They won the Munster Final of the Jimmy Bruen Shield in 1989, when the team was N. Noonan, N. Mills, P. J. Flynn, T. N. Coakley, J. Carroll Jnr., J. O'Riordan, O. Murphy, D. O'Brien, J. Minihane, C. Tobin, J. Byrns, J. O'Sullivan, M. Tobin and J. O'Leary. They won the Munster Final of the Irish Mixed Foursomes in 1987, when the team was, Paul Sweeney, John Carroll, Jerry Mehigan, Finbarr Hayes, P. J. Flynn, Kevin Brophy, Mark Kehoe, Michael Tobin, Jim Slattery, Ann Brophy, Noelle Twomey, Elma O'Brien, Eileen McSweeney, Mary O'Mahoney, Kay Papazian, Margaret Carroll, Maureen Nott. They won it again in 1988, when the team was John Carroll, P. J. Flynn, Mark Kooge, Jerry Mehigan, Denis O'Brien, Michael Stafford, Elma O'Brien, Noelle Twomey, Eileen McSweeney, Margaret O'Sullivan, Mary O'Mahony, Carmol O'Driscoll, Ann Leonard, Margaret Carroll and Ann Brophy, they were captained by C. K. Hall. The ladies of Bandon Golf Club won the ILGU Junior Cup1994, when the team was Lucy O'Mahony, Helen O'Brien and Ellen Tobin. They won it again in 2000, when the team was, Helen O'Leary, Margaret Sheehan and June Murphy. They won the ILGU Munster Intermediate League in 1980, when the team was Margo Murphy, Bunny Glancy, Margaret Carroll, Eileen McSweeney, Carmel O'Driscoll and Mary O'Mahony. They won it again in 1987, when the team was C. O'Driscoll, M. O'Mahony, A. Brophy, N. Twomey, S. McGrath, K. Papazian, M. Walsh, M. Carroll and E. McSweeney. They won the ILGU Munster Minor League in 1986, when the team was Martha Hall, Vera Philpott, Margaret O'Sullivan, Mary Cagney, Irene Noonan, Nuala O'Donoghue and Sheila O'Dea. They won it again in 1994, when the team was Lucy O'Mahony, Rose Lynch, Eileen Coleman, Angela Barrett, Teresa Walsh, Teresa O'Halloran and Freda McClement. K. Davis and A. Kingston were selected on the ILGU Junior squad in November 2000. Ian Stafford represented Ireland in the Boys' Home Internationals at Conwy G. C., Wales, in August, 1999, and played Munster Boys' in 1999 and 1998. Sean Conroy will remember his 17th birthday when he beat Terry McMahon of Muskerry on the 17th in the final of the Cork Inter. Scratch Cup Matchplay, on his home course. There is some confusion as to the foundation date of Bandon Golf Club. Either way, it is no doubt that it is one of the oldest Clubs in Munster. The Golfing Annual, 1896-97, gives September 1893, as its foundation date. The same publication, 1909-10, gives 1st January 1910, as the foundation date with J. J. Calnan, as Captain. The Sportsman's Holiday Guide, 1897, gives the following description "course within the demesne of Castle Bernard, Lord Bandon's beautiful place in Co. Cork. 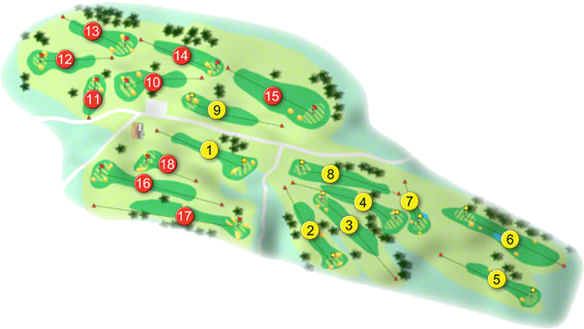 The green, which is a nine-hole one, is about one-and-a-half-miles round. The course where it is, is more or less a private one and supported locally. Secretary, L. Hewitt Esq., J. P. Clancole, Bandon."